RSVP For Our May Webinar! Reserve your seat at our webinar! 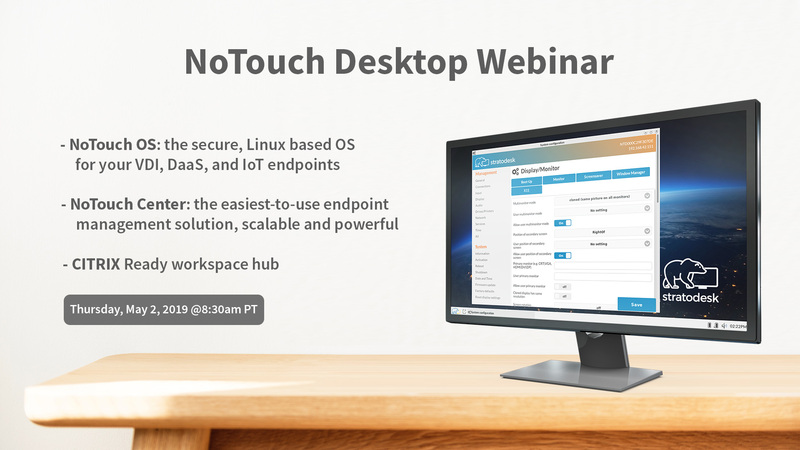 NoTouch OS is the Linux based, minimal footprint OS for your VDI, DaaS and IoT endpoints. Easily deploy NoTouch OS with one of our multiple boot options. NoTouch OS replaces Windows, or can run side-by-side Windows to enable BYOD deployments. NoTouch runs on any x86 and Raspberry Pi device. NoTouch Center lets you manage thousands of devices from one easy-to-use management center. By supporting inheritance of settings, groups can be easily set, configured and synced. Take advantage of multiple user roles, monitoring, asset management/inventory, Helpdesk and many other features expected from an enterprise grade solution. Stratodesk is the world’s leading endpoint OS and management solution. It is used by government and healthcare organizations, banks, SMBs and large enterprises to eliminate cost and scalability obstacles facing their complex network of devices. By delivering the only management software for mixed environments of x86, ARM and Raspberry Pi devices, Stratodesk is reinventing endpoint computing for enterprise IoT and VDI. Our cutting edge, linux-based solution, NoTouch, is hardware-agnostic and runs on the Raspberry Pi.